Hanuman is said to be the Swami or Overlord of all good and bad spirits, including Bhoot- Pret, Atrupt Atma, Pishacha, Chudail, the 49 Veers, 52 Veer and Yakshas. All the positive and negative mystical beings are said to obey the commands of Hanuman and hence if any person is possessed by ghosts or troubled by any other demon, then the worship of Hanuman is most beneficial and effective in removing the entity from the body or surroundings of the affected person. The regular chanting of some of the most powerful Hanuman Prayers, like the Hanuman Chalisa, Bheemroopi Maruti Strotra, Bajrang Baan and Hanuman Kavach are considered to be some of the more potent and beneficial methods of resolving all kinds of ghostly and paranormal issues. The methods of practicing Sadhanas of the Prayers mentioned above have been already described in many earlier posts. In addition to this, I would like to mention that the Sadhana of the Hanuman Kavach is widely practiced by Mantriks and Sadhaks, in order to get the blessings of Hanuman and be able to remove any ghostly or mystical entity form the body of a possessed person. Many Mantriks practice the Sadhana of the Pancha Mukhi Hanuman Kavach on the auspicious occasion of Narak Chaturdashi during the festival of Diwali. These Mantriks, chant the Pancha Mukhi Hanuman Kavach 1100 time on this day, accompanied by the worship of Hanuman. These Sadhaks, then offer oil to Hanuman and prepare Kajal from that oil. It is said that applying this Kajal in the eyes, not only improves eyesight, but it also gives protection to the Hanuman Devotee from all kinds of ghosts and demons. Another great benefit of applying the Kajal is that the devotee will never be cheated or deceived by anyone. These benefits of applying the Kajal in your eyes can be gained on the day of Narak Chaturdashi. However, if you know about any Sddhi Sadhak or Hanuman Bhakt who has practiced the Pancha Mukhi Hanuman Sadhana on the special day of Narak Chaturdashi, you can request him to give you some Kajal, which could prove to be effective even if it is used on other days. The power of the Hanuman Kavach can be seen from the fact that even Shri Ram, who is none other than Lord Vishnu himself, chanted it before going into battle with the Demon King Ravana. Many of our readers write to us from time to time, saying that long and time consuming Mantra Sadhanas confuse them, these readers often request for easy, simple and effective exorcism rituals and Mantras for getting relief from possession or any other paranormal problems. Such people, who are facing the problems mentioned above can always chant any of the smaller Mantras of Hanuman, which are equally powerful and effective in resolving their paranormal problems. 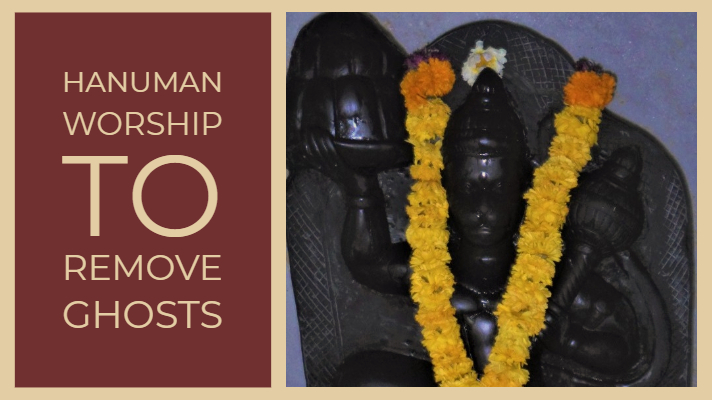 One of the Mool Mantras of Hanuman given below can prove to be very effective, if chanted for 1 Mala or 108 Mantra Chants daily or whenever needed to overcome any kind of fear, including fear from unknown sources. This Hanuman Mantra can be beneficial to both laypersons and advanced Sadhaks and spiritualists in getting the blessings and protection of Hanuman. Neel sir can I use Tulsi mala for the jap. बंद व्यक्ति मुक्त हो जाता है .श्रीराम ने यहां तक कह दिया है कि यदि इस कवच पाठ के बिना रामरक्षा स्तोत्र का पाठ किया जाय तो वह अरण्य रोदन है और स्तोत्र पाठ निष्फल है .